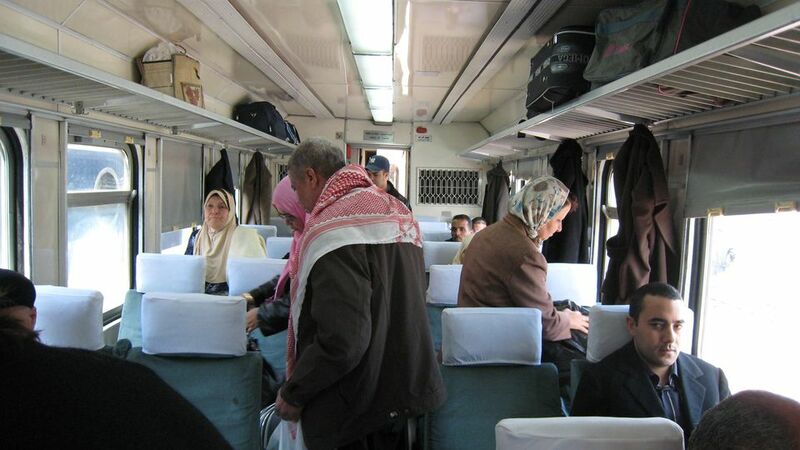 Traveling by train in Tunisia is an efficient and comfortable way to get around. The train network in Tunisia is not very extensive but many of the major tourist destinations are covered. Trains run between Tunis, Sousse, Sfax, El Jem, Touzeur, and Gabes. If you want to get to Djerba, catch a train to Gabes and take a louage (shared taxi) from there (about 2 hours). If you want to head to Southern Tunisia to see the desert, Matmata, and Tatouine, you can take the train as far as Gabes and then either rent a car or use the local bus service. Alternatively, take a train to Tozeur and head to Douz from there. If you're headed East, a train runs regularly to Gafsa in the middle of the country. If you want to check out the North East, trains from Tunis run as far as Ghardimaou and Kalaat Khasba (close to the Algerian border). North of Tunis, there are several trains a day to the picturesque port of Bizerte. For TGM information (the suburban train line) between Tunis, Carthage, La Goulette (for ferries to Italy and France) and Sidi Bou Said, scroll to the bottom of the page. For information about the tourist train, Lezard Rouge, scroll down. You can book your train ticket and even pay for it on the SNCTF website, but no bookings can be made more than 3 days in advance of your trip. The best way to book and pay for your train ticket is to go to a train station in person and pay in cash. In the summer, book 3 days in advance, outside of the tourist season and public holidays, one day in advance should be no problem. Confort Class, First Class, or Second Class? Confort class and First class are almost the same with regards to seat comfort and room. The main difference is the carriage is somewhat smaller in Confort Class, so there are fewer people in it. First class offers slightly bigger seats than second class, and they also recline (with a thud). There's a little more room for your luggage in the roof racks above your head as well. But unless you're traveling for more than 4 hours or so, a second-class seat would be a perfectly fine option and save you a little money. All long-distance trains have AC throughout the train. You can check schedules on the ​SNCFT web site. What do Train Tickets Cost? Train tickets are very reasonably priced in Tunisia. You have to pay for your tickets at the train station in cash or buy them online from the SNCFT web site. Children up to to 3 years old travel free. Children from 4-10 qualify for reduced fares. Children over 10 pay full fare. Here are some sample fares in Tunisian Dinar. See the SNCFT website for all fares ("tarifs"). The first number is the fare for first class; the second is the fare for second class. Conforte will be just a little more than First Class. A refreshment cart makes its way through long-distance trains serving drinks, sandwiches, and snacks. If you're traveling during Ramadan however, bring your own supply of food since the restaurant may well be closed. The trains really don't stop at the stations long enough to nip out and buy something. TGM - Commuter Train from Tunis to La Goulette, Carthage, Sidi Bou Said and La Marsa. The TGM is very easy to use, runs every 15 minutes or so and is extremely cheap. The only drawback is that it gets crowded with commuters. But that's easy to avoid if you hop on after 9 am in the morning and before 5 pm in the evening. Buy your tickets at the little booth before you get on and ask which side of the platform you should be on. Cost - from Sidi Bou Said into Tunis Marine (25 minutes) it's less than 1 TD. It makes very little difference as far as seat comfort goes if you travel second or first class. The Marine station in Tunis is about a 20-minute walk down the main avenue, Habib Bourguiba, to get to the walls of the Medina. You can also hop on a tram (Metro Leger) to complete your public transport adventure. The Lézard Rouge is a tourist train that runs in Southern Tunisia. The train departs from Metlaoui, a small nondescript town near Gafsa. The train was built in the early 20th Century and is an attraction in itself with wood-paneled coaches. The journey takes you through some spectacular desert scenery and the Selja Gorge to end up at an oasis. It runs almost every day between 1 May and 30 September starting at around 10 am. The train takes 40 minutes to get to the oasis and travels the same way back. Tickets are 20 TD for adults and 12.50 TD for children. Reservations are highly recommended, call the Tourist Information Office in Tozeur (76 241 469) or book through a travel agent.